Pulau Mantabuan is a volcanic made island and the smallest in the collection of islands that form Tun Sakaran Marine Park. Mantabuan nestles at a distance of 2km from Bodgaya, the largest island of the Park. The area of Mantabuan is 10 hectares. The only occupants are the nomadic community of Sea Gypsies who inhabit Mantabuan and surrounding islands. Known as the Bajau Laut, they live in their boats or huts built on stilts on coral reefs. Though the place is not commercially developed, there is a Malaysian army base on Mantuabuan. The island has no other inhabitants other than the soldiers and the nomadic Sea Gypsies. 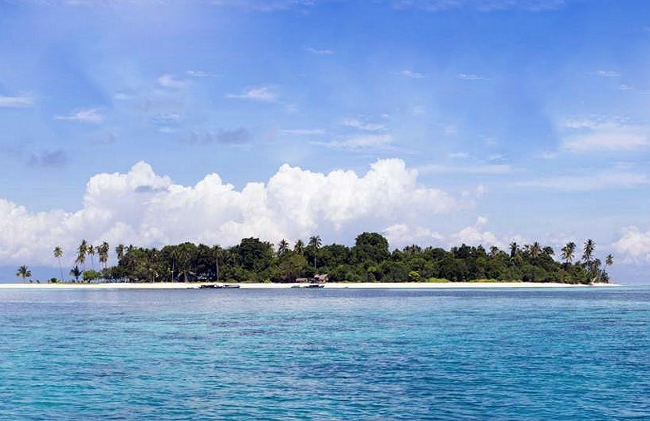 Like most of the islands in the area, Mantabuan has excellent visibility and is good for diving and snorkelling. Black Coral Garden with its pristine iridescent bushes. Stingray Alley Way with its blue-spotted ribbon eels, flamboyant cuttlefish, and colorful nudibranch collection. Star Point Star Point with its Moorish idols, damselfish, angelfish, and barracuda. Puffer fish, blue-spotted sting rays, crocodile fish, and sea turtles are also found here. Diving and snorkelling trips to Mantabuan are regularly organized from Mataking, Pom Pom and Semporna. The marine community of Sea Gypsies is a major attraction for tourists because of their unique lifestyle of living on water and subsisting on resources provided by water. They are inheritors of an atypical way of life that is fast vanishing. There are no resorts or hotels in Mantabuan and in general on the islands of the Tun Sakaran Marine Park. Visitors are lodged in nearby islands like Pom Pom Island, Pulau Mataking, Singamata or the nearby Sabahan town of Semporna. From Semporna to Mantabuan: 35 minutes boat trip. From Mataking and Pom Pom Islands: about 20-30 minutes. From Mabul island, count 90 minutes to reach Mantabuan. Contact us for more information about Mantabuan.